Contribute to the development of a Community Geodetic Model (CGM). The goal of this effort is to develop a crustal motion model consisting of velocities and time series for southern California that leverages the complementary nature of GPS and InSAR observations. This requires development of optimal methods for combining GPS and InSAR data, characterizing seasonal/hydrologic/anthropogenic signals, accounting for earthquake effects as needed, and quantifying covariances in order to produce a suite of reliable models. Proposals should demonstrate coordination with the current activities and established timeline of the CGM project. 2016 work should focus on completion and evaluation of the CGM merged GPS time series solution; estimation and comparison of velocities, seasonal, and earthquake-related motion from these time series; and development of InSAR velocity maps for the southern California region. Technique development to prepare for full utilization of legacy and newly available SAR data for time series analysis and identification of optimal approaches for mitigating temporally and spatially correlated noise in GPS or InSAR time series are also particularly encouraged. Analysis of geodetic data to address specific SCEC4 research targets. Studies addressing geodetic/geologic slip rate discrepancies, assessing the role of lower crust/upper mantle processes in driving fault loading, developing more physically realistic deformation models, providing input to the development of Community Stress Models, and constraining physics-based models of slow slip and tremor are encouraged, as are studies that pursue integrated use of geodetic, geologic, seismic, and other observations targeting special fault study areas. Proposals that include collection of new data should explicitly motivate the need for such efforts. In compliance with SCEC's data policy, data collected with SCEC funding must be made publicly available upon collection by archiving at UNAVCO (contact Jessica Murray for further information on archiving). Annual reports should include a description of archive activities. Improve our understanding of the processes underlying detected transient deformation signals and/or their seismic hazard implications through data collection and development of new analysis tools. Work that advances methods for near-real-time transient detection and applies these algorithms within the SCEC transient detection testing framework to search for transient deformation in southern California is encouraged. Approaches that can be automated or semi-automated are the highest priority, as is their inclusion in the testing framework now in place at SCEC (contact Rowena Lohman for details on how to address this in the proposal). Extension of methods to include InSAR and strainmeter data and, when available, the CGM is also a priority. Work that develops means for incorporating the output of transient detection algorithms into time-dependent earthquake forecasting is encouraged. Develop and apply algorithms that use real-time high-rate GPS data in concert with seismic data for improved earthquake response. We encourage proposals that explore new approaches for assimilating real-time high-rate GPS, seismic data, and other potential observations into efforts to rapidly characterize earthquake sources. Also of interest is the development and application of rigorous retrospective and prospective tests to evaluate algorithm performance. Data collection and compilation. Funning, along with a graduate student and SCEC intern, carried out campaign GPS field work to obtain additional data at 23 benchmark sites in the Western Transverse Ranges, along the Elsinore fault, and in the northern Mojave desert. The additional data produced new velocity estimates for several sites with only one previous data point and resulted in more precise velocities for other sites. The data, which will be incorporated into the CGM, help to densify the secular velocity field for interseismic studies and establish a baseline of observations at more sites ahead of future significant earthquakes in the region. McGill, Bennett, and Spinler continued campaign GPS data collection and modeling for the San Bernardino Mountains (SBM) and San Gorgonio Pass (SGP) area (Figure 1). This has resulted in the publication of velocities for 41 sites in the SBM and the establishment of 23 sites in the SGP. Additional data collection for the latter during 2015 will improve existing preliminary velocities. This project continues to involve SCEC interns, undergraduates, and teachers in fieldwork and data analysis. Through a collaboration between CICESE and SIO, Sandwell and colleages conducted rapid-static GPS fieldwork in the Mexicali Valley along the Imperial and Cerro Prieto fault in order to improve estimates of shallow interseismic creep rates. Future CGM versions will aim to include these short-occupation, high spatial-density observations. In support of the CGM and to ensure the maximum usage of SCEC-funded data in years to come, Floyd has taken the lead on transfer of legacy GPS data from the SCEC archive to the UNAVCO archive. This effort has involved identification of relevant datasets and verification of metadata. In addition, Floyd has interacted with PIs to facilitate the gathering of GPS data from recent SCEC-funded efforts and the provision of these data for inclusion in the CGM. Drawing upon these and other data, Shen has produced an updated set of campaign GPS time series that incorporates data collected since the CMM4 (2004) and utilizes current, self-consistent processing strategies. This compilation features 130 new campaign sites, and 50 continuous sites have been included for the purpose of reference frame alignment. Metadata were thoroughly reviewed and corrected as needed to ensure the accuracy of processed results. Development and application of methods for model-based data synthesis and comparison of results. Creating the CGM requires synthesis of existing results and development of new methodologies for analyzing and combining GPS and InSAR data via appropriate models to generate GPS station time series, spatially gridded InSAR time series, and a self-consistent integration of the two. A central aspect of this is the comparison of results obtained using different approaches. Both the GPS-focused and InSAR-focused CGM participants have been engaging in such comparisons. To aid in this process, Herring and Floyd developed scripts for differencing, averaging, and computing comparison metrics for GPS time series and velocities that were produced by different processing centers. Application of these tools to GPS data has shown a good overall level of agreement. It has also highlighted the need to account for differences among processing strategies that influence position estimates and their reported uncertainties and, in turn, reference frame realization. Other factors such as inclusion of a scale term in reference frame adjustment and use of regional versus global reference frames are additional sources of significant variation in GPS time series and velocities produced by different groups. GPS time series analysis strategies for estimating secular rates parameterize time-varying and constant signals and characterize noise sources in a variety of ways. McCaffrey has developed one approach that incorporates dislocation models to separate postseismic deformation from secular rates. The spatial coherence provided by the dislocation models is especially valuable when estimating velocities for GPS sites with little or no pre-earthquake data. Integration and interpretation of GPS and InSAR observations requires accurate characterization of vertical deformation. Hammond et al. carried out a detailed analysis of vertical rates in the Ventura Basin by combined use of InSAR, GPS, leveling, and tide gauge data. The long-term vertical GPS velocities were obtained through application of a non-parametric median-based approach that is robust in the presence of steps and outliers. LOS velocities derived from the GPS rates, along with a regional deformation model, are used to constrain the InSAR LOS velocities and isolate the vertical motion. The resulting rates document basin subsidence due to groundwater level fluctuations and uplift consistent with contraction due to the Western Transverse Ranges and San Andreas Fault (SAF) systems. The four data sets span different time periods from the 1930s to the present but suggest steady vertical rates except in areas of anthropogenic signals. 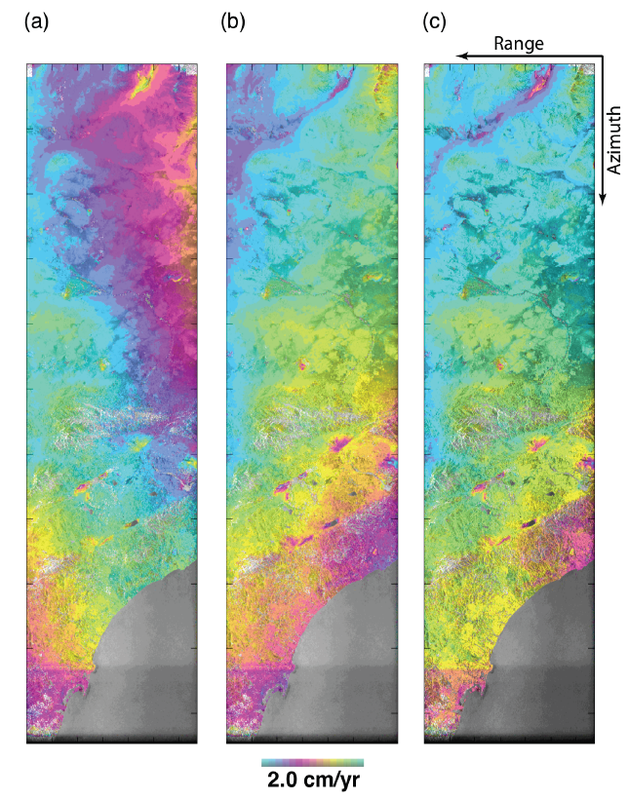 PIs focusing on InSAR time series analysis have made important advances in the past year. Tymofyeyeva and Fialko developed a technique that reduces InSAR time series scatter by averaging redundant interferograms that share a common scene in order to estimate and remove the ionospheric and tropospheric noise. Using the corrected interferograms in InSAR time series analysis, these authors documented time-varying interseismic deformation along the Blackwater Fault. They found little evidence for previously inferred deformation across the Hunter Mountain Fault and suggest that InSAR LOS velocities used in earlier studies may have been contaminated by seasonal variations. In a second important development, Liu found that by correcting empirically for a temporally correlated local oscillator drift (LOD) error in Envisat data, it is possible to generate a deformation map based on InSAR data alone that is comparable to one obtained with a GPS-based correction (Figure 2). Agreement between InSAR-only motion estimates and GPS observations demonstrates the possibility of obtaining accurate velocity maps and time series from InSAR data even in regions with sparse GPS coverage. Application of the empirical correction to data from the Eastern California Shear Zone shows that transient deformation inferred from the InSAR data cannot be explained by the LOD error and is more likely due to long-term postseismic deformation. Sandwell led software development to extend the capability of GMTSAR for use with ALOS-2, Sentinel 1, and ScanSAR data. These tools will enable SCEC scientists and the broader geodesy community to fully utilize the wealth of new SAR data that are becoming available. These data will allow vastly improved InSAR time series analysis, directly impacting future versions of the CGM. Deformation modeling. Tong, Sandwell, and others have developed a viscoelastic earthquake cycle model to investigate geologic/geodetic slip rate discrepancies along the Mojave segment of the SAF. 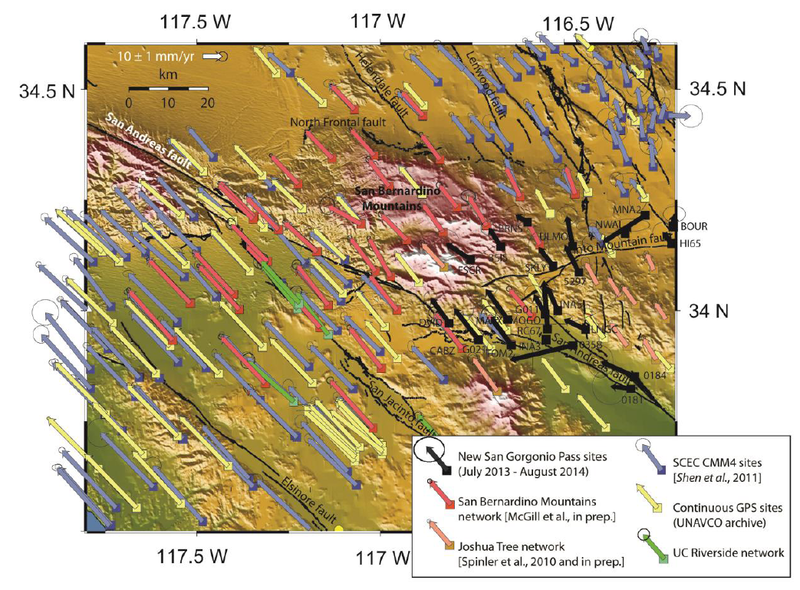 McGill, Spinler, and Bennett used GPS data to infer a slip rate of 6.5 /- 3.6 mm/yr for the San Bernardino section of the SAF; this agrees with geologic estimates at 95% confidence. Avouac et al. developed a robust and efficient method for investigating combinations of simultaneous physical processes that best explain observed postseismic deformation. They apply this method to the El Mayor Cucapah (EMC) postseismic GPS data to study the roles of afterslip and viscoelastic relaxation, trade-offs between these processes, and their potential impact on nearby faults. Meanwhile, modeling of vertical velocities near the Cerro Prieto geothermal area by Sandwell and colleagues Trugman and Borsa suggests that stressing rates in the vicinity of the EMC hypocenter exceed the tectonic rate, perhaps due to extraction of water during geothermal production. Utilizing the UCERF3 horizontal GPS velocity field and the vertical rates of Hammond and Burgette (see above), which exhibit a gradient of 2 – 4 mm/yr over 100 km, Johnson inferred ~10 mm/yr of shortening across the Transverse Ranges. This may occur, in part, as 8-10 mm/yr reverse slip on faults of the Ventura Basin. In a parallel study, Marshall and colleagues incorporated the new CFM v5.0 geometry and used GPS and InSAR data to infer slip rates on the Ventura and Oak Ridge faults of the Ventura Basin. While they report little vertical deformation in this region, their slip rate estimates are in general agreement with those of Johnson. Strain transient observation and technique development. Wyatt and Agnew continue to operate the Piñon Flat Observatory (PFO), despite budget constraints. The long history of laser strainmeter (LSM) observations have recorded repeated transient events in the days to weeks after moderate local and larger distant earthquakes as well as events not correlated with earthquakes. Motivated by their observations of swarm-like clustering of small earthquakes and swarm migration, Shearer et al. are using PFO LSM and PBO borehole strainmeter data to investigate possible causative processes including fluid flow and aseismic slip (Figure 3). 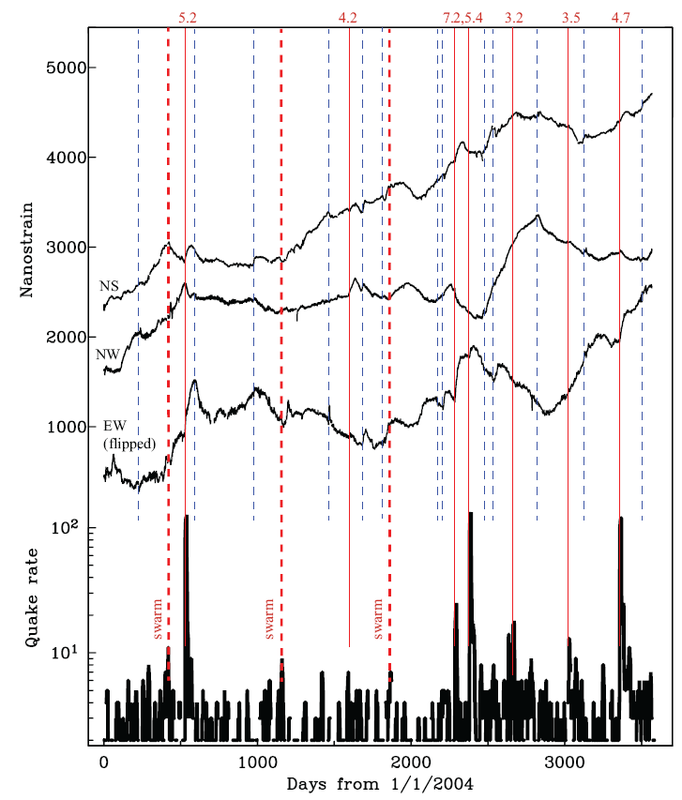 This work has identified at least ten instances of strain anomalies correlated with peaks in the local seismicity rate. Some, but not all, of the anomalies correlate with M>3 earthquakes, however not all moderate earthquakes have associated strain transients and some transients occur without a M>3 earthquake. These observations may indicate that the strain anomalies associated with increased seismicity rate arise from slow slip at depth on the San Jacinto Fault just north of the 2006 M5.2 Anza earthquake. Agnew and colleagues are meanwhile testing the newly developed Trench Optical Fiber Strainmeter (TOFS) which may present an alternative to LSMs that is easier to install and operate. Two TOFSs have been installed at PFO, and a third is planned for 2015, to enable testing and calibration of the systems. While TOFS data are noisy at periods exceeding several hours, ongoing work is focused on noise reduction techniques. Geodetic methods for improved earthquake early warning. Bock et al. continued development of seismogeodetic approaches for earthquake early warning. This work included shake-table testing of low-cost MEMS accelerometers and a geodetic module developed by his group and deployment at existing continuous GPS sites. This technology produces real-time 100 Hz position streams constrained by GPS and accelerometer data. Related work focused on further development of algorithms that use these data to improve real-time magnitude estimates via scaling relationships and finite fault modeling, the latter of which also provides additional source information useful for refining EEW alerts and tsunami modeling. Surface offsets from LiDAR data. Nissen et al. have focused on further development of techniques for estimating 3D surface offsets from repeat-pass LiDAR data in areas with heavy vegetation. This work was done as part of the VISES collaboration and used two recent earthquakes in Japan as test cases. They have shown that this approach can be robust, not only in densely vegetated regions, but also for zones of steep displacement gradients and for imagery separated by long (e.g., 2 – 4 year) time intervals.